NO OTHER INTEGRATED PACKAGE BRINGS SO MUCH HOME FOR SO LITTLE. ITS POWER, VALUE, AND VERSATILITY DWARF A FEW MINOR DEFICIENCIES. One of the most convincing arguments for multipurpose software is price. With a list price of just under $300, Apple Works GS costs less than $50 per application. MS-DOS fans on tight budgets can purchase Works from discounters for just under $150. Triple-digit software isn't cheap, but everyone knows that low prices mean poor quality. Well, surprise! The newest version of Spinnaker's BetterWorking Eight-in-One delivers a desktop full of utilities, an outliner, a word processor with a spelling checker and a thesaurus, a spreadsheet, a graphing program, a database, and a telecommunications program—all for $59.95. And it's definitely not a low-budget affair. Anyone familiar with menu bars, drop-down windows, and dialog boxes will instantly feel comfortable with Eight-in-One. From its main menu, you can select applications, access desktop accessories, manipulate files, format and copy disks, and configure the program to suit your computer. Once inside an application, the Quit menu offers options for returning to the main menu or moving directly to other applications. Onscreen help is available from any screen. For keyboard input, you use a combination of arrow and function keys. Use the left and right arrows to move across the menu bar. Press the down arrow to open the highlighted menu window; pressing it again moves you through the options list. The up arrow will move the cursor up the list and will ultimately close the window. These same techniques work anywhere in the program and soon become second nature. Except where numeric or textual input is specifically required (as in word processing, for example), the program accepts mouse input as an alternative to most keyboard commands. For example, if the message "F1 for Help," appears on the screen, you can click on F1 to access Help. The same intuitive approach to mouse control works equally well in most situations. Novice MS-DOS users will appreciate the clarity and completeness of Spinnaker's manual. It explains everything you need to know to get Eight-in-One up and running. In addition, it includes a glossary of commonly used computer terms, as well as several appendices about the basics of hardware, software, and DOS. Eignt-in-One's word processor provides most features included in similar programs from other publishers, In addition, it includes many surprising extras not commonly available elsewhere. Its 100,000-word spelling checker will check and correct an entire document or verify the spellings of individual words. The program also lists suggested spellings, automatically replaces misspellings when necessary, and permits users to personalize their dictionaries by adding words they commonly use. Numerous other features contribute to the word processor's overall effectiveness. Two documents can be held in memory at the same time, allowing you to switch between them with the ALT-D command. A printer queue lets writers work with one document while printing another. The word processor can import text files produced by other Spinnaker applications, and it can load and save text files in ASCII format for exporting to other programs. A View option displays final documents the way they will appear on paper, and users can import graphics (PCX and PCC formats) into their word processor files. Eight-in-One doesn't support WYSIWYG (What You See Is What You Get) displays or customized fonts. But once you've configured the program, you can use double-wide pica, condensed text, superscripts, subscripts, and other available fonts. If your printer supports italics, boldface, and underlining, you can use those, too. For writers who frequently mix fonts of different widths, Eight-in-One automatically adjusts line lengths to show exactly how many words will appear on each line. A status section at the top of the screen displays the active typeface and style along with other pertinent information. If you want help organizing your thoughts before committing them to disk, try out the program's outliner. Because rearranging entries is so easy, outliners encourage you to keep working until you get things right. 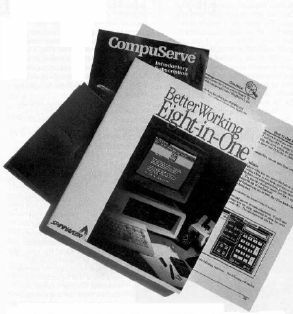 Eight-in-One's outliner shares many of the word processor's features. What makes the outliner different is its organizing capabilities. You can arrange and rearrange headings and subheadings. If you promote or demote an entry, the items under them will automatically adjust to maintain perfect outline form. With this outliner, you can choose from Roman numeral format, Arabic numeral format, or a special format that indents subheadings but omits level indicators entirely. After you've completed an outline, you can save it as an outline file or export it as an ASCII file. Writing is a big part of any integrated package, but a good database is worth its weight in floppies. Although Eight-in-One's database module offers considerably less power than today's advanced stand-alone products, it can handle many tasks well. Since the program stores individual records on disk, rather than maintaining an entire file in memory, hard disk owners can create files with thousands of records. Each record can contain an undefined, but large, number of fields distributed over 55 screen lines. You can define your fields as character, numeric, date, logical, and memo. Numeric fields can hold literal values or formulas that manipulate other numerics within each record. When the time comes to produce reports, the database's report generator performs nicely. It's versatile and easy to use. You can write short form letters and merge appropriate data; you can generate mailing labels; and you can design and save as many as ten customized reports for each data­base file. If you wish, you can save an ASCII version for use in a word processor. One deficiency in the database module requires mention: The Find function acts on only one field at a time. For example, a simple search can find all records that contain the last name Locklin. And, it can uncover all entries that mention Toronto, Canada. It can also locate all individuals under 18 years of age, However, the program can't scan for a combination of matching fields: all Locklins under 18 who live in Toronto, Canada, for example. Eight-in-One's spreadsheet is also a strong asset. Although memory restrictions limit each file to about 4500 cells (on a 640K computer), the actual space you can work with spans 32,768 rows × 10,000 columns. The program can import and export documents in Eight-in-One, Lotus 1-2-3 (versions 1A and 2.0), and DIF formats. The print routine automatically handles extra-wide spreadsheets for side-by-side display. The spreadsheet even has its own graphing component. In the spreadsheet, mouse control really struts its stuff. A click-and-drag motion highlights a block for easy copying, cutting, or pasting. Clicking the rightmost mouse button alternates between menu and edit screens. In most respects, this spreadsheet works much like any other. Column widths can be adjusted, Cells can contain text, literals, or formulas. You may format them lo display data in a wide variety of ways (dollars or percents, for example), and the usual array of predefined functions is available. You can also lock titles onscreen both horizontally and vertically, thereby providing necessary guidance when scrolling through large files. 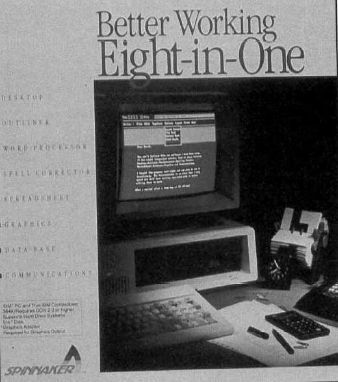 Eight-in-One's graphics module confines itself to the creation of charts and graphs. Six types are available: bar charts, line graphs, shaded line graphs, pie charts, exploded pie charts, and scatter points. You can enter data directly from the keyboard or import it from the program's spreadsheet or database module. Define the low and high ranges to be displayed, or, alternatively, the computer will calculate reasonable ranges and use them. With a few quick keystrokes, you can change a bar chart into a line graph or pie chart. Save your completed graphs to disk, print them, or export them for use in other applications. On balance, the graphics module is adequate for creating simple, two-dimensional graphs, but it can't do much else. Serious users will require something with more muscle. When it comes to communications software, simplicity is often better than an impressive list of confusing options. From this perspective, Eight-in-One's communications program has much to offer. With all settings left at their defaults—COM1, 1200 baud, full duplex, no parity, eight data bits, and one stop bit—the program should be ready to work with most computer configurations and the vast majority of commercial services and local bulletin boards (provided you've installed a modem). Choose Communications from the main menu, enter a phone number in the directory, and select Dial to activate autodialing. The communications module also provides sufficient flexibility to satisfy many intermediate and advanced users. It supports transmission speeds from 300 to 9600 baud. The software can address any one of four serial ports, and its phone book can hold up to ten numbers. Users can create ten short macros to simplify log-ons. Four terminal-emulation modes are available (Standard, Televideo 930, DECVT-100, and IBM 3101), and the program supports XMODEM and ASCII protocols for uploading and downloading to and from remote terminals. All of these applications would be enough for any integrated package, but Eight-in-One doesn't stop there. Its Desktop menu includes six short utilities: Memo Pad, Address Book, World Clock, Calendar, Do List, and Label Maker. These aren't memory-resident pop-ups of the SideKick sort, nor are they true desk accessories in the Macintosh tradition. Instead, accessing these utilities requires closing the current application. Though somewhat inconvenient, the process works pretty smoothly. With Memo Pad, you can write notes, save them to disk, and recall them later. Address Book stores up to 200 names, addresses, and phone numbers. Calendar keeps track of your appointments, and the Do List will remind you of as many as 45 important chores. And Label Maker makes printing a mailing label a snap. The Desktop's World Clock, besides displaying the time in 16 major cities around the world, boasts a handy alarm clock, which will notify you at the preset time no matter where you are within Eight-in-One. Another convenient extra is the pop-up calculator, available anywhere at the touch of the ALT-K keypress combination. You can paste the results of the calculations into any Eight-in-One document. The key to any integrated product is its ability to pass information between modules. True to form, Eight-in-One permits a wide range of file-sharing possibilities. The word processor can import files written by the spreadsheet, database, and memo pad. 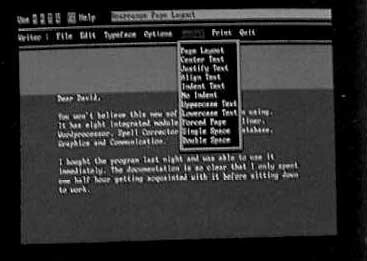 ASCII files that you receive through the communications module can be loaded into the word processor for editing. In addition, you can export word processing files for use by the database or communications programs. Is this a perfect program? Of course not. When using the thesaurus, I had some trouble scrolling with my mouse (but not with the arrow keys). Similar problems with mouse control occurred within the database and other applications. I encountered a few isolated inconsistencies between the documentation and the program itself. However, none of these errors were fatal to the program. The spelling checker is a bit slow, and some users might gladly exchange the program's limited graphing module for a full-featured paint program. And, since word processing files are entirely memory-resident, document size is limited to 50 pages or so on a 640K computer. Every software product contains compromises, which inevitably open the door for criticism. Overall, Better-Working Eight-in-One delivers power, more versatility, more value for the money than any other integrated package designed for the home.